Singer/songwriter/actor. As a guy, I'm voting for his talent. Take into account his music: "Niji," "Heart," "Message," "Squall," and "Sakurazaka," which he wrote, sang, and even played guitar on ("Niji"). Then take a look at his acting record: "Meguriai," "Bijo ka Yaju," and "Perfect Love." You won't find a more talented person out there. Oda Yuji? Sure he's a better actor, but he can't sing. Kawamura Ryuichi or Gackt? Sure, they're talented singers/songwriters, but they can't act. Closest call? Fujii Fumiya, but his acting and singing career has gone downhill lately. But maybe I'm biased 'cause I sang and played his songs on my guitar and got my girlfriend! Extremely talented guy. I love alot of his songs, and after seeing bijo ka yajuu and hitotsu yane no shita, I can conclude this is the only artiste i really admire so far. He writes songs, sings, looks cool for the girls, a natural actor and freakin cool in his 2 roles i've seen so far, and i've heard he's even involved in photography. If i were a girl i think i would definitely fall for this kinda guy. I was never a fan of Masha's. I thought he was just average in the 2 dramas I saw him in (Perfect Love and Meguriai), but Itsuka Mata Aeru changed all that. After seeing him in Galileo and Hitotsu Yane no Shita 1, I found myself liking him more. That, plus rediscovering his popular songs just made me decide to vote for him. Not to mention, he's hot! not only he can act , he is a very good musician. he can sing, compose, produce songs. on top of that he is a photographer as well. during olympic 2000 at atlanta he was hired as a photographer to cover the games by fuji tv. One of the best looking Japanese actors in my opinion! Totally awesome in Bijo ka Yajuu, really enjoyed his performance. Also love his song "Tokyo" for Slow Dance and nerdiness in Galileo. Kwaaaaa!! I love this guy. When I dfirst spotted him in Beauty and the Beast I thought, Hmm. Interesting but no very hot. But he grows on you! He such a great actor, who is hot, hot, hot. Kakko ii !! He is one of the most talented artiste/celebrity. Plus he's good looking. I really admire him. Suave & boyish-like, he is hot! .... his latest drama 'Galileo' omoishiroi. like his everything! very talented guy. natural in acting, funny but serious, calm, friendly. like his talents. dj, photography, singing. cool character. my one of an idol! A very talented artiste who can sing, compose, act, DJ a programme and produce good photography. My fave artiste since watching him in Hitotsu Yane No Shita 1 & 2. Started to like him since Under One Roof. Not just a talented singer, but great actor with good acting skills. He has quite a number of big hit dramas. i starts admiring him when he acted in the 'not so Perfect Love'...can't resist to see his face..hehe.. n he's got good manly voice too..
well peformed in Bijo ka Yajuu..... he pulled off the comedy as well as touching lines and did it so naturally that find its real. he's the sexiest and talented man! He's a DJ, artistic photographer, an amazing actor and a gifted singer! Ganbatte ne Fuku chan! definitely charming...can really bring his roles to live....really liked him in Beauty or Beast (Bijo ka Yajuu). As Hiromi san, he gave a magnificent performance beside Nanako Matsushima in Beauty or beast. 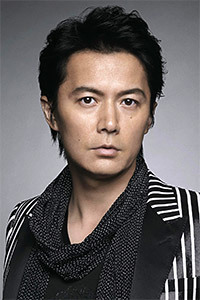 One of the best japanese actor around. Love his music, songs and acting. Fuku, kanbade!!! A very talented artist. Great actor, singer and songwriter.. I really admire him! Very very very talented guy, he's charming because of all his talents he has. In most of his roles, he has the persona of an endearing tantalizing flirt. a great musician!!! i liked (and still does) for the longest time!!!!!!!!! dreamy~ talented. A real artist XD how com he's not in the top 50?????? i like him more since know if he is singer too..he's so talented man.. He is so talented - TV, Music, Radio, Photography.. plus, he's cute! !